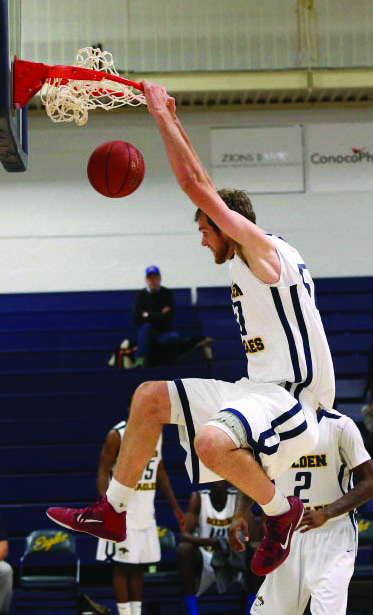 Six more games were recorded since the USU Eastern Golden Eagles started out the season with four straight wins. Getting ready for the semester to end, the team has gotten off to an excellent start, with a 9-1 win-loss record. Games so far have been played against a variety of talent and the Golden Eagles have had to prove themselves early in the season, which prepares them to enter region play next weekend. On Nov. 15, the Golden Eagles hosted Impact Academy from Las Vegas, Nev., and came out with a resounding win. The team shot an incredible 67.1 percent from the field, going 11-18 from behind the 3-point arc. Eight out of the 14 players that got into the game for the Golden Eagles had double-digit point totals led by Kendahl Amerson with 27 points. Jalenie Neely added 14 points along with dishing out six assists to his teammates. Coming off the bench, both Mark Guymon and Teotoni Do led the team in rebounds with 10 apiece. When the final buzzer sounded, the Golden Eagles walked off the court with a 140-72 victory. The following day the team once again faced Impact Academy. This game, seven of the 14 players that got in to the game, scored in double-digits. Todd Helgesen led the team with 24 points and in rebounds with eight offensive and six defensive for a total of 16. Neely once again led the Golden Eagles in assists dealing out 10. Travon Langston also helped the team adding 15 points and recording three steals as well. At the end of the game, the Golden Eagles were able to walk away with the weekend sweep of Impact Academy with a final score of 124-79. During the weekend of Nov. 22 and 23, the Golden Eagles hosted the Salt Lake All-Stars, a team that comprised some former College of Eastern Utah players that came to play against the current team. The team was able to get out and run during in the first half against the alumni team and hit 51 percent of their shots from the field. Four players had double-digit point totals led by Amerson once again with 20, while Neely again dished out 10 assists and brought down seven rebounds. Helgesen did lead the team in the rebound category for the second straight game with 10, grabbing seven of them on the offensive side of the court. Again the Golden Eagles were able to walk away with the victory, final score 111-86. The second game of the weekend turned out to be a good one for the Golden Eagles as well, with five players in double-digits. Amerson again led the team in points with 28 while adding three steals. Both Helgesen and Neely recorded double-doubles; Helgesen had 15 points and 14 rebounds while Neely had 10 points and 11 assists. Leland Miller recorded four-blocked shots for the team. Josh Van Weezep went off from behind the 3-point arc for the Golden Eagles hitting five out of his seven attempts for a percentage of 71.4. The team was once again able to complete the weekend sweep with a 108-73 victory. Following the Thanksgiving holiday, the team travelled to Rock Springs, Wyo., to play in a tournament hosted by Western Wyoming Community College. In the first game of the weekend, the Golden Eagles faced Central Wyoming College. totals. Neely had 20 and hit 12 out of 16 attempts from the charity stripe while Langston had 13 and hit four out of his six field goal attempts along with hitting five out of six attempts from the free throw line. Again Helgesen led the team in rebounds grabbing seven. It was a much closer game then the Golden Eagles wanted but at the end they were able to squeak out a close one in a hostile environment, winning 79-77. Currently, the Golden Eagles have the greatest shooter from behind the 3-point line statistically in the NJCAA along with one other player in the top 100. Van Weezep has hit 13 out of his 19 3-point attempts for a field-goal percentage of 64.8 making him the most accurate player from long distance. Amerson is currently ranked 71 in 3-point field goal percentage as well from deep with a 47.5 percentage. “It is really nice to have guys that can stretch the floor for us, that is what we were missing last year,” said Vando, then added, “When we need a three it is nice to have guys that we can look for and know that they can knock it down.” As a team the Golden Eagles knock down almost 44 percent of their shots from deep. The team will head to Ephraim, to play in another tournament hosted by Snow College during the weekend of Dec. 6 and 7 before returning home to begin region play by hosting North Idaho College and the College of Southern Idaho on Dec. 12 and 14, respectively.